1. Preheat the oven to 180°C, gas mark 4. Lightly grease a 23cm pie dish with a little of the melted butter. Blitz the biscuits to a fine crumb in a food processor, add the melted butter and pulse until the mixture resembles wet sand. Transfer to the prepared dish and spread over the bottom and up the sides, pressing the mixture down firmly with the back of a spoon. Bake for 5 minutes, until golden. Remove from the oven and set aside to cool. Leave the oven on. 2. Finely grate the zest from the limes and squeeze the juice. Whisk the egg yolks in a bowl. Gradually whisk in the condensed milk until smooth, then mix in the lime juice and zest. 3. Pour the filling into the crust and level with the back of a spoon. Return to the oven for 15 minutes, or until just set, then remove and place the dish on a wire rack to cool at room temperature. Chill in the fridge for 3 hours. 4. Whisk the cream until just stiff then spoon dollops over the top of the pie. 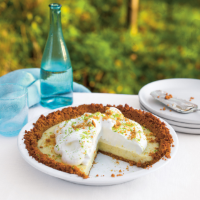 Sprinkle over the lime zest and crushed biscuit to decorate before serving. This recipe was first published in Tue Mar 03 09:42:00 GMT 2015.